One of the specific purposes for designing a programming language in the world is to provide a solution for people that face challenges in their day to day activities. However, there are some programming languages that are more powerful than the others and also there are some that need support from other programming languages to bring a perfect solution. Today in Guide Tricks I am going to discuss six (6) programming languages that you must master in other to be a super programmer. 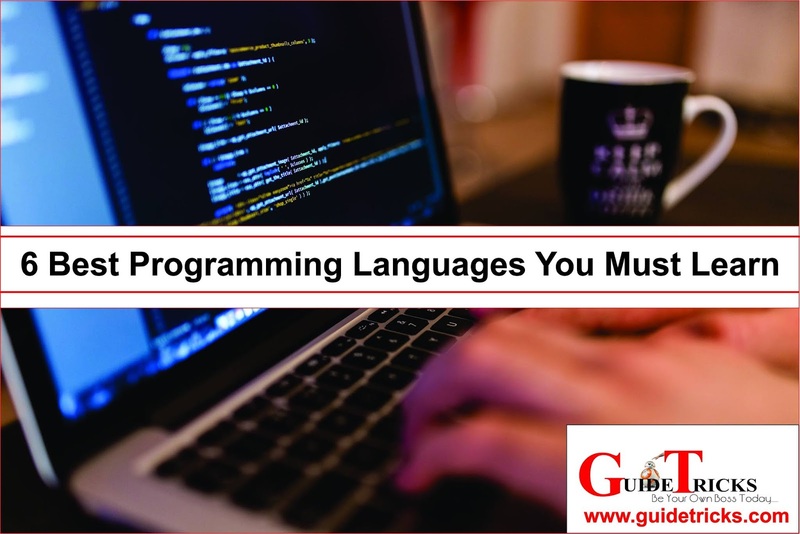 Put in mind there is no programming language in the world that is completely Build each programming language is designed to solve a specific problem. you cannot do everything by learning just a single programming language if you wish to provide a solution to different purposes then consider learning different programming languages. 1.==> C++: This is one of the best and powerful programming language in the world, you have to learn and learn this If you want to be a great programmer, in every aspect of programming you will definitely come across with C++ and if you complete learn C++ learning other programming languages like Java and C# will be completely simple to you. 2.==> Java: It is also referring to the mother of programming language and one of the most popular well-known programming language nowadays. It is a platform in depended on everything now is all about java Games, Applications, mobile apps, and web application are all build with this programming language but another thing I would like you to know here is that if there is no C++ there is no Java completely. 3.==> C#: The next programming language, of course, is C# is also one of the most popular programming languages today. If you wish to get started with developing windows application or windows games or developing anything related to windows then, you must learn C#. in fact, it is the only programming language that is used in developing windows tools or application. 4.==> C: This is also another best programming language, the reality here is if there is no C programming there will be no C++, C#, and Java, everything has been implemented from C. C++ is just drive from C Programming and the language is close to hardware so when you are going for embedded system programming then C is what you need. 5.==> Python: Python is quite a new language but is getting much popular. Python is very strong because you can build everything with it, and it is very easy it takes you nothing more or less than one week to master the variables and strings so it means you can master it very quickly. 6.==> PHP: The last one which is PHP the only and the only one, this language is very flexible and popular it is mostly used in web pages development or software development. So, if you are interested in learning website design or software development consider learning this language. It is one of the most popular script languages for web development and software development. So those are the programming languages you need to master if you really want to be a super programmer. if you find this post helpful kindly drop your appreciation in the comment section below and don’t forget to share with your lovely ones. Happy visiting!! wow really nice blog thanks for the great work! !